Sink into our own hearts first | The Better Plan . .
We are improvers, changers, and fixers, especially when it comes to improving and changing other people, especially loved ones like children and spouses. We seem to be gifted at identifying the faults and flaws of others and then fixing those flaws according to our improvement plan. Of course, with this responsibility of correcting others we are constantly on the lookout for effective resources to help our cause. A good book on going vegan and reducing calories can be an excellent improvement tool, or a magazine article on the need for regular exercise, or a sermon on guarding the edges of the Sabbath. We are convinced, yea, verily, we are convicted that if a loved one or a friend, in the midst of living in a way that we can’t approve of, would just read this book or listen to this sermon that it would change them. For the better. This text is very, very choice theory. It affirms the choice theory axiom that the only person we can control is ourselves. It urges us to stop looking at others as the problem and to begin to look within. “Let all of my words sink into your own heart first.” We may feel convinced that criticizing and nagging are our only options, that someone we know would really benefit from the Truth, but our role isn’t to convict others with our words. Our need is to listen to them carefully for ourselves. The message in Ezekiel doesn’t prevent us from sharing our opinions with others. It just says to let God’s words sink into our being first. It reminds me to focus on the person I am responsible for, the person I can control, that person being me. It reminds me, too, that there is a way, a time, and a place for improvement messages to be shared with others. Such sharing is always dependent on a positive relationship being in place. Such sharing is also dependent on my having let the words sink into my own heart, on my having experienced the transformation that I am hoping for in the other person, and on my asking for and receiving permission from that person to talk about the topic in question. When others know that we love them and that we recognize their power to choose, heartfelt discussions can take place without defensiveness and manipulation. Begin to make plans to attend one or both of the Soul Shaper workshops this summer at Pacific Union College. 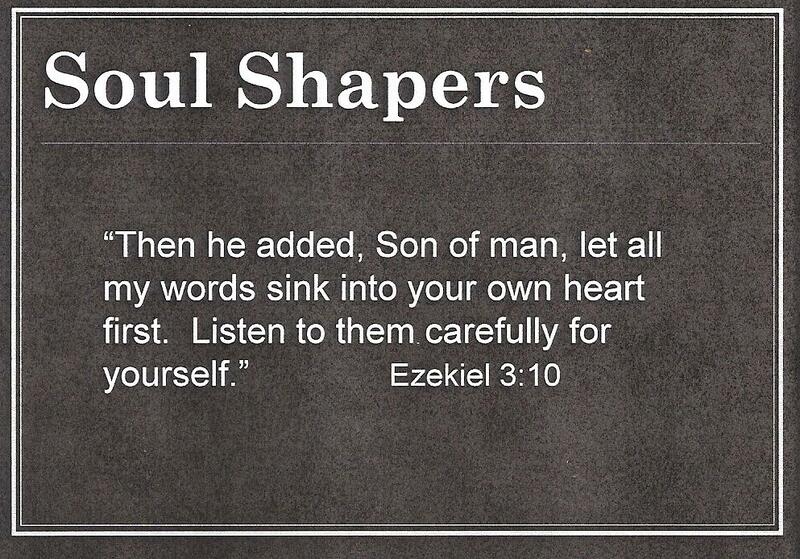 Soul Shapers 1 meets June 17-20. Soul Shapers 2 meets June 24-27. Encourage colleagues to attend as well. Remember that Soul Shapers 2 can be taken more than once. It is an excellent way to recharge your choice theory battery and review non-coercive classroom strategies. Both workshops can be taken for one or two hours of credit (your choice). If you need elective credits for your Master’s program, I can work with you individually to create that credit option. I would very much like to see you at PUC this coming June!